* As our pieces are hand crafted, please note that there may be slight variations in actual size. BONE: All bone used by us is a by-product of industries that make use of non-endagered, non-exotic species of domesticated bovine (such as domestic beef bone). Colour Infused/Antiqued Bone: These pieces are done using our own process and natural dyes. These pieces may be done at time of order and my require an extra day or two before the item ships. Some pieces may have a water resistant sealant applied. Please note: Bone pieces will take on skin oils and will change over time, becoming unique to the wearer. And, as each piece of bone is unique, no two pieces will take color, antique (age), in the exact same way; please anticipate variations in coloration. Bone is not Ivory: Ivory is dentin; more specifically, it is from the tusks of certain animals-to include the long-extinct mammoth. We DO NOT use ivory from any source and we DO NOT use, nor do we condone, the use of any materials that are obtained from endangered, or otherwise threatened, species. OUR GUARANTEE: all of our bone pieces are made using solid bone. We do not use any resins or composite materials. Horn pieces are 100% water buffalo horn--guaranteed! HORN IS NOT ANTLER. 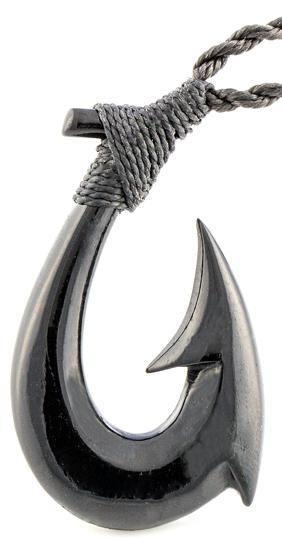 As the horn is naturally black, no dyes are necessary. Please anticipate some color variations among pieces. Some pieces may show slight hints of a brownish/amber coloration esp when held to a light. JADE gets its name from the Spanish "piedras de ijadas," (stones of the loins). It has been used throughout time for tool making and for adornment; to many it has a special spiritual significance and it is believed to have healing qualities (esp for the kidneys). The Latin translation of "piedras de ijadas" is "lapis nephriticus" (nephrite stone). It came to be called simply, nephrite. Greenstone is what New Zealanders call nephrite jade. 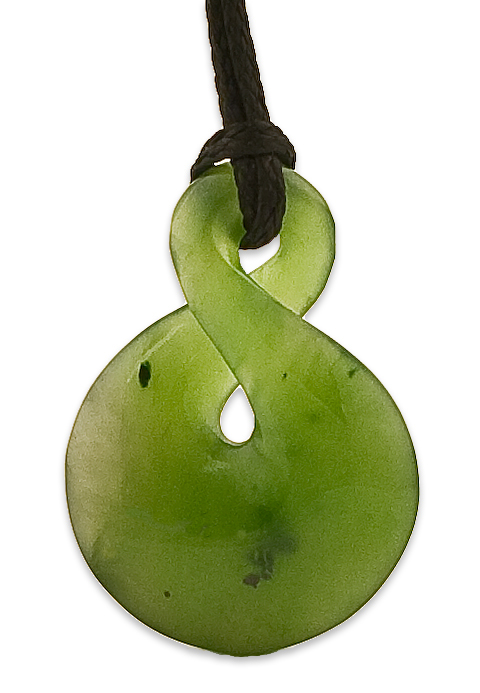 Pounamu is the Maori word for the nephrite jade (greenstone) found in Aotearoa (New Zealand). 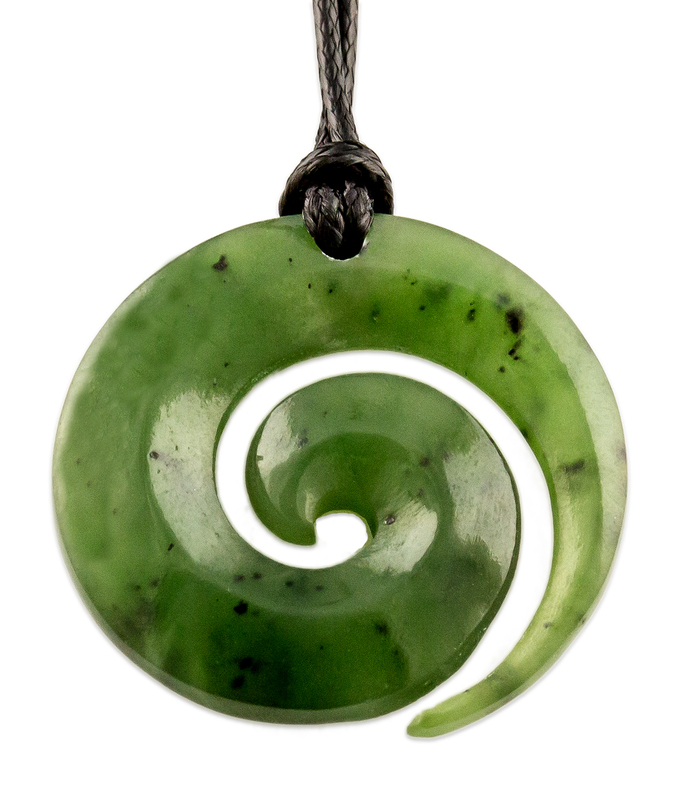 Pounamu can also refer to other green stones such as serpentine and bowenite that are also found in New Zealand. Black Jade (aka Cowell jade) from South Australia is a true nephrite green jade; higher levels of iron give it a black appearance. When held to the light, or under close inspection, hints of green can be seen. If there are no indications of green when held to the light, or with a magnification source, it is a good indicator the it is not truly jade but may be a different stone that has been dyed. Please Note: As our items are made using natural, untreated, jade please anticipate some variations in coloration among pieces that are consistent with this fact. Images: Certain images may be photographed with back lighting to show the transluscence of the jade. The item received may appear darker when worn. Sandwashed Jade: these pieces have been put through our unique process and lightly buffed to give them a unique, more primitive, appearance. OUR GUARANTEE: we guarantee any item we refer to as jade to be true nephrite jade. Many stones are called jade but are in fact various other stones, such as: dyed agate, serpentine, dyed quartz, bowenite, etc. In Asia, the term jade is used loosely to refer to any pretty stone (usually either green or black, but sometimes other colors). True jade must be either Nephrite or Jadeite. Nephrite is the stone that was originally named jade. When Jadeite was discovered (it is found mostly in Myanmar) it was believed to be the same as nephrite, but was later found to be chemically different. It may also be referred to as Burmese Jade, or Imperial Jade. Paua is the native Maori word for the highly desired species of abalone that is specific to New Zealand waters. Paua is made from the actual shell that has been carefully polished to reveal its hidden beauty. Nacre is the substance found inside a variety of mollusks, to include the pearl oyster, from which pearls are formed. It is also known as mother-of-pearl. It typically has a white apprearance; but, due to its irridescent qualities, it will exhibit hints of various colours depending on the angle of its illumination. Please Note: our items, made from these natural, organic, sources, will exhibit natural variations among pieces. OUR GUARANTEE: If the abalone is not from New Zealand, it cannot rightfully be called Paua. 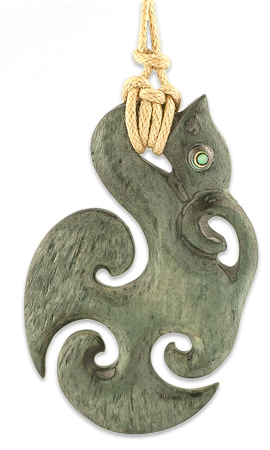 We use only genuine New Zealand Paua shell in our pieces. Our Pacific Pearl items are genuine nacre gathered from the pearl oyster. Onyx (black agate): onyx is a variant of Chalcedony (agate) that has white and black banding. It is a smooth stone that is cool to the touch. As black is the absorption of all colour, black onyx is a symbol of strength. Carnelian (agate): carnelian is a form of chalcedony, agate, which naturally exhibits varying shades of red, orange and white. It represents personal power, confidence, initiative, courage and happiness. Why Stainless Steel? If you like the look of silver, but not the cleaning headaches and the high cost, stainless steel is the perfect alternative. Also, due to the fact that it is amazingly hypoallergenic, it is a great alternative for those with a sensitivity to metals. Stainless steel is far superior to the base metals (such as copper, iron, nickel, lead and zinc) used by others. These cheaper alternatives will oxidize and corrode over time and are much more likely to cause skin irritation. If you want a piece that will bring the person who wears it beauty, stlye, and enjoyment, for years to come, our stainless steel pieces are the way to go. OUR GUARANTEE: We use high quality 316 stainless steel that has a high resistance to rust, corrosion, and tarnishing. This does not mean, however, that no staining is ever possible: environments that may promote staining are those with high salinity and/or low-oxygen. The legends of Pacific Island peoples show their long history of a deep connection to the sea and to the land. Their works of art and adornments reflect this integral relationship between the people and their surroundings. They were used to communicate ideas about who they were, from where they had come, and to represent their connection to both the corporeal and spiritual worlds. Each shape, and the materials used, has a meaning, a purpose, that transcends the physical object itself. Our pieces are a tribute to the peoples, namely of New Zealand and Hawaii, whose lives and cultures inspired such beautiful legends and works of art.